The five commemorative quarter-dollars to be issued in 2010 and the sister five-ounce, .999 fine silver bullion versions are part of the America the Beautiful Quarters and the America the Beautiful Silver Bullion Coins programs. 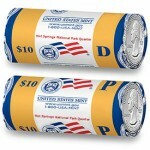 The new programs over the next 11 years will feature rotating reverse designs -- 56 for each -- that honor national parks and other national sites in each state, the District of Columbia (DC) and each United States territory -- Puerto Rico, Guam, American Samoa, U.S. Virgin Islands and Northern Mariana Islands. 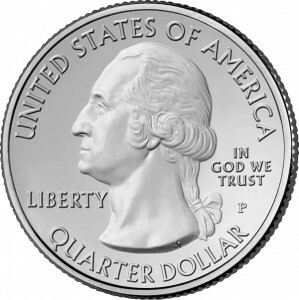 With interest already gaining momentum for the new series of quarter dollars scheduled to begin next year, CoinNews Media Group LLC is pleased to be able to offer a resource that all will find illuminating, the AmericaBeautifulQuarters.com Web site. 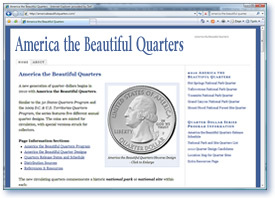 From the most seasoned numismatist to the newest entrant to the hobby, America the Beautiful Quarter is a one-stop informational site teeming with all of the designs, release dates, specifications and news relating to the America the Beautiful Quarters Program from the United States Mint.